What’s the best way to get inside tips about a destination? You should ask the locals, of course! According to our personal experience, we’ve prepared a lovely, practical and easy-to-share e-book about the top 10 places to visit in Sardinia. It contains a mix of nature, culture, traditions and fun, in order to let you experience different sides of this beautiful island. We hand-picked 10 top places to introduce you in a world of ancient treasures, colours and shades, people, clear rivers and rolling valleys, golden beaches and rugged cliffs; the strong flavour of Cannonau wine and the sweeping melodies of the “Trallallera” dancing. 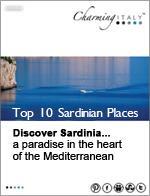 Your E-book “Top 10 Sardinian Places” is available for free.